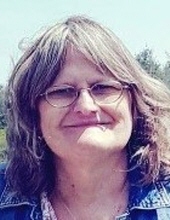 Nancy Jones 55, of Midland died at home Tuesday afternoon, April 9, 2019 surrounded by her family after a lengthy illness. She was born on May 10, 1963 in Midland, daughter of Dorothy (Jewell) King and the late Edward King. She attended Midland schools. The former Nancy King married Randall Jones on December 23, 1982 in Midland. Nancy had been an assistant manager at Dollar Daze. She enjoyed watching NASCAR, playing bingo, cooking and baking, gardening, casino trips, spending time with her family especially her two grandkids and fishing at the creek with the kids. Nancy is survived by her husband; Randy, son Robert King, son Roy (Kelly) Jones, daughter Felicia Jones, by grandchildren Autumn and Charlotte Jones. Also surviving are siblings; Edward (Edna) King, Donald (April) King, Kathy Ward, Barb (Craig) Oswald and Kevin King and by many nieces and nephews including special niece and nephew Tiffany and Cody. In addition to her father, Nancy was preceded in death by her son Randall Jones, grandson Robert Lewis, Jr., and brother-in-law Terry Ward. Funeral services for Nancy will take place at 1:00 p.m. Monday, April 15, 2019 from the Ware-Smith-Woolever Funeral Home, 1200 W. Wheeler with Pastor Rob Schmidt officiating. Burial will be in Midland City Cemetery. Nancy’s family will receive friends at the funeral home on Sunday from 1:00-3:00 p.m. and on Monday from 11:00 a.m. until time of service. Those planning an expression of sympathy are asked to consider the family. Nancy’s family would like to give a special thank you to Residential Hospice and Pardee Cancer Treatment for their care and compassion. To plant a tree in memory of Nancy Jones, please visit our Tribute Store. "Email Address" would like to share the life celebration of Nancy Jones. Click on the "link" to go to share a favorite memory or leave a condolence message for the family.